The oldest working clock in Britain is dated c 1386 and housed in Salisbury Cathedral. This magnificent yet primitive timepiece, made without a dial, called monks to worship. The friars in turn would ring the cathedral’s bells to summon the congregation. The wonderful exhibition of clocks – Innovation and Collaboration – explored the early development of the pendulum clock which revolutionised accurate timekeeping. It focused on the ‘golden age’ of clocks and watches in London that is largely captured in the hundred-year period of the seventeenth century. The objects shown in the exhibition were treasured by the individuals who commissioned them. 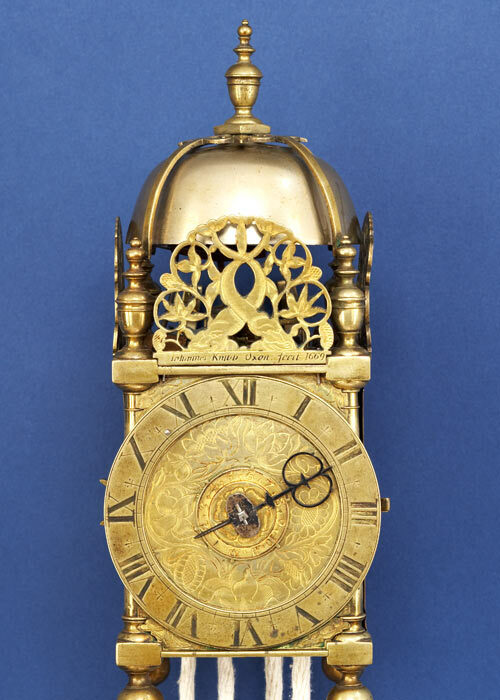 Early clockmaking was both labour and capital-intensive, so clocks were expensive and largely made to order. An examination of these historic clocks allows us to celebrate precision engineering at a time before even the humble metal screw was invented. Much of the painstaking and skilful work would have been done by candlelight in London workshops along Fleet Street, just a few miles from Mayfair, where the exhibition took place. Clockmaking was a collaborative and creative process; started by blacksmiths used to hammering wrought iron and then bringing together many other skills – casting, wheel-cutting, chasing, engraving, cabinet making and marquetry work. 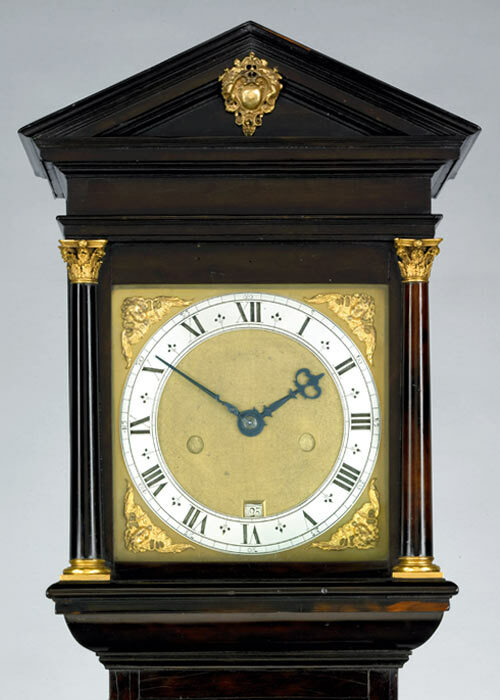 Whilst there is much debate over who inspired who as far as the very first pendulum clocks are concerned - what is certain is that there was extensive collaboration amongst the clockmakers themselves. What is also now clear is the fact that clock designs influenced furniture design. It was the clockmakers, looking to house their dials and mechanisms in metaphorical “shrines”, who inspired wood turners and furniture makers to use precious woods from newly-discovered overseas territories, giving birth to the art of cabinetmaking. These craftsmen used veneers of hardwood on a frame of oak or pine to mix utility with aesthetics, creating delights out of exotic Princes wood and ebony, as well as English walnut. Perhaps ironically many of these master clock and watchmakers, who studied the art of precision and measurement, left very little information about themselves. Samuel Knibb, all of whose signed clocks are on display, was a particularly enigmatic character. But what a wealth of information is conveyed through the clocks and watches themselves! Some say that the spirit of the makers lives within the instruments’ workings and the chimes you hear are the same notes heard centuries ago. To listen to a clock striking is a sound to behold. To hear a musical clock is magical and to experience clocks chiming together is like listening to an orchestra in full flow. These rare and beautiful clocks rely on being carefully maintained and cherished by their current owners and this exhibition has been made possible because of the generous support of two collectors, Dr John C Taylor OBE and another private individual who wishes to remain anonymous. We are also very grateful to the other owners who lent their precious exhibits. The majority of clocks have come from private homes, rarely seen by the public, and there were also wonderful objects from public collections including the Worshipful Company of Clockmakers and the Science Museum, London. We thank them all for their significant contribution to this magnificent exhibition. Here, the exhibition’s curator Richard Garnier explains the themes of the exhibition. Mechanical clocks originated in 14th century to help foregather monks and friars to perform their required ‘offices’ (church services) that were regularly spaced throughout day and night. Spreading to town halls in the 15th century, and then grander private households, before the invention of the pendulum, clocks remained accurate to no more than plus or minus 15 minutes a day. Life was thus reckoned more by morning, midday, afternoon, evening and night than by the hour. Early clocks needed checking (daily ideally) against a sundial, often not possible in English weather. This inaccuracy meant long-duration clocks were impractical, the maximum running time being between eight and 30 hours. Nonetheless, mechanical clocks were seen as embodying the relationship of man to the workings of the Universe, thus taking on philosophical meanings and being loaded with astronomical and religious calendar indications. They were expensive and often richly decorated. The idea of the lone experimenter or scientist labouring in isolation has more recently given way to a realisation that science has often advanced through collaborative endeavour. The same holds true for advances in clockmaking and timekeeping. This was driven forward principally by the need for accurate timing of astronomical observations, from which safer navigation at sea was hoped for. The harnessing in the later-1650s of the astronomical (hand-propelled) pendulum to clockwork provided a huge step-change. It gave accuracy within seconds a week, so clocks of longer duration than the previous maximum running time of 30 hours became practical. A revisionist theme of this exhibition is that the development and deployment of the pendulum to clockwork, after its invention by the Dutchman Christiaan Huygens, was more of an Anglo-Dutch collaborative effort than previously realised. This collaboration continued towards the century’s end with Huygens communication of his ‘equation kidney’ to English clockmakers. High quality timekeepers were never cheap, but their intrinsic value was often enhanced by the use of expensive materials, techniques of decoration or both. Many of these were newly introduced to England at the time of the Restoration. This speaks of a burgeoning luxury market, initially serving the court and the monarch at its head. Increasingly, after the Restoration this spread down into the ‘middling sort’ of people, comprising the new bourgeoisie of merchants and wealthier tradesmen. The importance of patronage by the crown in driving this market should not be underestimated. Heads of state (James I, Charles I, Protector Cromwell, then Charles II, James II and the later Stuart monarchs) were keen to be seen as patrons of the arts and sciences in justification and glorification of their all-surpassing status. In corresponding synergy, leading clockmakers were keen to attract royal patronage, to publicise their own skills and marketability. With greatly enhanced accuracy achieved through the pendulum, life started to become regulated by the clock, giving rise to the term o’ clock. It was also now worthwhile making clocks that ran for longer on each winding, not only the now-standard week-going, but also month, three month, and even year-going. There was great concentration on quality and inventiveness, so that English (London) clockmaking after the Restoration rapidly came to lead the world. In attempted improvement of the verge, other pendulum escapements were developed: the pendulum crossbeat, tic-tac, and anchor escapements. Added mechanical complications could include varying forms of striking notation, such as ‘Dutch’ and ‘Roman’ hour-striking, quarter-striking and Grande Sonnerie, or music played on galleries of graduated bells. The way Classical architecture at the Restoration had royalist, and even absolutist or papist associations was difficult for many. Fromanteel, an arch Protestant, who had been under the recent protection and patronage of Oliver Cromwell, may well have chosen Classical architecture for the cases of his newly-introduced pendulum clocks as a deliberate statement to demonstrate his political conformity. His use of such pure, correct classical architecture was unique at the time. Fromanteel’s clock cases are some of the earliest (if not the earliest) pieces of English cabinetwork with expensive thin-cut ebony veneers overlaying a well-crafted carcass of oak. They must have struck an immediate contrast with the predominant solid oak furniture. By comparison, the cases of other London makers were not quite so correctly Classical. From the early 1670s the architectural nature of clock cases was reducing. More colourful veneers were then being introduced, either as plain wood or in decorative marquetry. Clock cases were an integral part of innovative, contemporary interior decoration, not lagging behind furniture styles as historians once thought.